On Sunday the East Sussex Cross Country League began the new season with a race at Warren Hill, above Eastbourne, hard by Beachy Head. By the inscrutable workings of fate, I seem to have become the Seaford Striders representative, so it seemed to behove me to take part. It was a glorious morning, with little mud in evidence. Cross country runners have an ambivalent relationship with mud. On the one hand, mud is a necessary condition for the sport. On the other, a mud-free run in conditions like today's is undeniably pleasurable. We began with a slight uphill through the car park and past the finishing point. Thence a long downhill, on which I opened the throttle and overtook many younger runners. All downhills come to an end and become ascents, and as we started on the second part of the race, the younger runners overtook me and had their revenge. One even overtook me, and then walked up most of the rest of the hill. I thought I might catch her, but failed. Cross country is the purest form of running, just as in horse racing the jumps offer a more satisfying and coherent experience than the flat. It is annoying therefore to have the experience spoilt by a runner who passed me while podcasting. It's bad enough that people choose to listen to music on headphones while running races in the countryside. When they decide to inflict their music on the rest of the field, it really is too much. I console myself by the thought that the culprit is unlikely to stay the course and runs all the races through the winter. 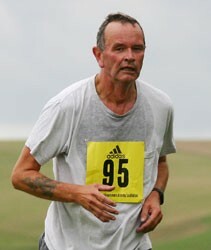 I finished, and, unlike the Lewes Downland Ten Mile, I was not the last to do so. The race was impeccably organised by the ESSCCL and marshalled by, among others, Eastbourne Rovers.